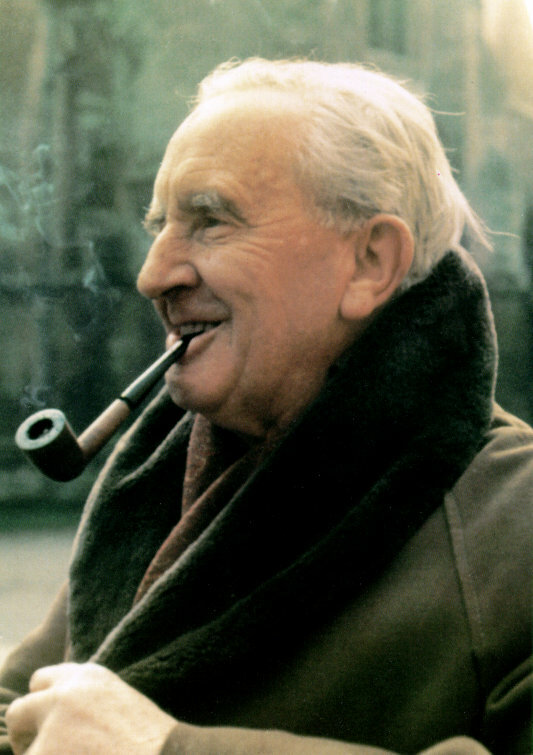 3 January 1892– 2 September 1973) was an English writer, poet, philologist, and university professor, best known as the author of the classic high fantasy works The Hobbit, The Lord of the Rings, and The Silmarillion. Most of Tolkien's paternal ancestors were craftsmen. The Tolkien family had their roots in Lower Saxony, but had been living in England since the 18th century, becoming "quickly intensely English". The surname Tolkien is said to come from the German word tollkühn ("foolhardy"). German writers have suggested that in reality the name is more likely to derive from the village Tolkynen, near Rastenburg, East Prussia. The name of that place is derived from the now extinct Old Prussian language. Tolkien's maternal grandparents, John and Edith Jane Suffield, were Baptists who lived in Birmingham and owned a shop in the city centre. The Suffield family had run various businesses out of the same building, called Lamb House, since the early 19th century. From 1810 Tolkien's great-great-grandfather William Suffield had a book and stationery shop there; from 1826 Tolkien's great-grandfather, also named John Suffield, had a drapery and hosiery business there. John Ronald Reuel Tolkien was born on 3 January 1892 in Bloemfontein in the Orange Free State to Arthur Reuel Tolkien (1857–1896), an English bank manager, and his wife Mabel, née Suffield (1870–1904). The couple had left England when Arthur was promoted to head the Bloemfontein office of the British bank for which he worked. Tolkien had one sibling, his younger brother, Hilary Arthur Reuel, who was born on 17 February 1894. As a child, Tolkien was bitten by a large baboon spider in the garden, an event which some think would have later echoes in his stories, although Tolkien admitted no actual memory of the event and no special hatred of spiders as an adult. In another incident, a family house-boy, who thought Tolkien a beautiful child, took the baby to his kraal to show him off, returning him the next morning. When he was three, Tolkien went to England with his mother and brother on what was intended to be a lengthy family visit. His father, however, died in South Africa of rheumatic fever before he could join them. This left the family without an income, and so Tolkien's mother took him to live with her parents in Kings Heath, Birmingham. Soon after, in 1896, they moved to Sarehole , then a Worcestershire village, later annexed to Birmingham. He enjoyed exploring Sarehole Mill and Moseley Bog and the Clent, Lickey and Malvern Hills, which would later inspire scenes in his books, along with Worcestershire towns and villages such as Bromsgrove, Alcester, and Alvechurch and places such as his aunt Jane's farm of Bag End, the name of which would be used in his fiction. Mabel Tolkien herself taught her two sons, and Ronald, as he was known in the family, was a keen pupil. She taught him a great deal of botany and awakened in him the enjoyment of the look and feel of plants. Young Tolkien liked to draw landscapes and trees, but his favourite lessons were those concerning languages, and his mother taught him the rudiments of Latin very early. He could read by the age of four and could write fluently soon afterwards. His mother allowed him to read many books. He disliked Treasure Island and The Pied Piper and thought Alice's Adventures in Wonderland by Lewis Carroll was "amusing but disturbing". He liked stories about "Red Indians" and the fantasy works by George MacDonald. In addition, the "Fairy Books" of Andrew Lang were particularly important to him and their influence is apparent in some of his later writings. Tolkien attended King Edward's School, Birmingham, and later St. Philip's School, before winning a Foundation Scholarship and returning to King Edward's School. While a pupil at King Edward's School, he was one of a party of cadets from the school's Officers Training Corps who helped "line the route" for the coronation parade of King George V, being posted just outside the gates of Buckingham Palace. Mabel Tolkien was received into the Roman Catholic Church in 1900 despite vehement protests by her Baptist family, who then stopped all financial assistance to her. In 1904, when Tolkien was 12, she died of acute diabetes at Fern Cottage in Rednal, which she was then renting. Mabel Tolkien was then about 34 years of age, about as old as a person with diabetes mellitus type 1 could live with no treatment—insulin would not be discovered until two decades later. Nine years after his mother's death, Tolkien wrote, "My own dear mother was a martyr indeed, and it is not to everybody that God grants so easy a way to his great gifts as he did to Hilary and myself, giving us a mother who killed herself with labour and trouble to ensure us keeping the faith." Prior to her death, Mabel Tolkien had assigned the guardianship of her sons to Fr. Francis Xavier Morgan of the Birmingham Oratory, who was assigned to bring them up as good Catholics. Tolkien grew up in the Edgbaston area of Birmingham. He lived there in the shadow of Perrott's Folly and the Victorian tower of Edgbaston Waterworks, which may have influenced the images of the dark towers within his works. Another strong influence was the romantic medievalist paintings of Edward Burne-Jones and the Pre-Raphaelite Brotherhood; the Birmingham Museum and Art Gallery had a large collection of works on public display. In 1911, while they were at King Edward's School, Birmingham, Tolkien and three friends, Rob Gilson, Geoffrey Smith and Christopher Wiseman, formed a semi-secret society which they called the "T.C.B.S. ", the initials standing for "Tea Club and Barrovian Society", alluding to their fondness for drinking tea in Barrow's Stores near the school and, secretly, in the school library. After leaving school, the members stayed in touch and, in December 1914, they held a "council" in London at Wiseman's home. For Tolkien, the result of this meeting was a strong dedication to writing poetry. The 1911 census of England and Wales shows Tolkien (occupation "school") lodging at 4 Highfield Road, Edgbaston, along with his brother Hilary (occupation "hardware merchant's clerk"). In 1911, Tolkien went on a summer holiday in Switzerland, a trip that he recollects vividly in a 1968 letter, noting that Bilbo's journey across the Misty Mountains ("including the glissade down the slithering stones into the pine woods") is directly based on his adventures as their party of 12 hiked from Interlaken to Lauterbrunnen and on to camp in the moraines beyond Mürren. Fifty-seven years later, Tolkien remembered his regret at leaving the view of the eternal snows of Jungfrau and Silberhorn ("the Silvertine of my dreams"). They went across the Kleine Scheidegg to Grindelwald and on across the Grosse Scheidegg to Meiringen. They continued across the Grimsel Pass, through the upper Valais to Brig and on to the Aletsch glacier and Zermatt. His guardian, Father Francis Morgan, viewing Edith as a distraction from Tolkien's school work and horrified that his young charge was seriously involved with a Protestant girl, prohibited him from meeting, talking to, or even corresponding with her until he was 21. He obeyed this prohibition to the letter, with one notable early exception which made Father Morgan threaten to cut short his University career if he did not stop. On the evening of his twenty-first birthday, Tolkien wrote to Edith a declaration of his love and asked her to marry him. Edith replied saying that she had already agreed to marry another man, but that she had done so because she had believed Tolkien had forgotten her. The two met up and beneath a railway viaduct renewed their love; Edith returned her engagement ring and announced that she was marrying Tolkien instead. Following their engagement Edith reluctantly announced that she was converting to Catholicism at Tolkien's insistence. Her landlord, a staunch Protestant, was infuriated and evicted her as soon as she was able to find other lodgings. Edith and Ronald were formally engaged in Birmingham, in January 1913, and married at Warwick, England, at Saint Mary Immaculate Catholic Church on 22 March 1916. In 1914, the United Kingdom entered World War I. Tolkien's relatives were shocked when he elected not to immediately volunteer for the British Army. Instead, Tolkien entered a program wherein he delayed enlisting until completing his degree in July 1915. He was then commissioned as a Second Lieutenant in the Lancashire Fusiliers. He trained with the 13th Battalion on Cannock Chase, Staffordshire, for eleven months. In a letter to Edith, Tolkien complained, "Gentlemen are rare among the superiors, and even human beings rare indeed." Tolkien was then transferred to the 11th Battalion with the British Expeditionary Force, arriving in France on 4 June 1916. His departure from England on a troop transport inspired him to write his poem, The Lonely Isle. He later wrote, "Junior officers were being killed off, a dozen a minute. Parting from my wife then ... it was like a death." Tolkien served as a signals officer at the Somme, participating in the Battle of Thiepval Ridge and the subsequent assault on the Schwaben Redoubt. According to John Garth, however: Although Kitchener's army enshrined old social boundaries, it also chipped away at the class divide by throwing men from all walks of life into a desperate situation together. Tolkien wrote that the experience taught him, 'a deep sympathy and feeling for the Tommy; especially the plain soldier from the agricultural counties.' He remained profoundly grateful for the lesson. For a long time, he had been imprisoned in a tower, not of pearl, but of ivory. Tolkien's time in combat was a terrible stress for Edith, who feared that every knock on the door might carry news of her husband's death. In order to get around the British Army's postal censorship, the Tolkiens had developed a secret code which accompanied his letters home. By using the code, Edith was able to track her husband's movements on a map of the Western Front. During his recovery in a cottage in Little Haywood, Staffordshire, he began to work on what he called The Book of Lost Tales, beginning with The Fall of Gondolin. Throughout 1917 and 1918 his illness kept recurring, but he had recovered enough to do home service at various camps and was promoted to Lieutenant. It was at this time that Edith bore their first child, John Francis Reuel Tolkien. When he was stationed at Kingston upon Hull, he and Edith went walking in the woods at nearby Roos, and Edith began to dance for him in a clearing among the flowering hemlock. After his wife's death in 1971, Tolkien remembered, I never called Edith Luthien – but she was the source of the story that in time became the chief part of the Silmarillion. It was first conceived in a small woodland glade filled with hemlocks at Roos in Yorkshire . In those days her hair was raven, her skin clear, her eyes brighter than you have seen them, and she could sing – and dance. But the story has gone crooked, & I am left, and I cannot plead before the inexorable Mandos. This incident inspired the account of the meeting of Beren and Lúthien, and Tolkien often referred to Edith as "my Lúthien". Tolkien's first civilian job after World War I was at the Oxford English Dictionary, where he worked mainly on the history and etymology of words of Germanic origin beginning with the letter W. In 1920, he took up a post as Reader in English Language at the University of Leeds, and became the youngest professor there. While at Leeds, he produced A Middle English Vocabulary and a definitive edition of Sir Gawain and the Green Knight with E. V. Gordon, both becoming academic standard works for several decades. He also translated Sir Gawain, Pearl, and Sir Orfeo. In 1925, he returned to Oxford as Rawlinson and Bosworth Professor of Anglo-Saxon, with a fellowship at Pembroke College. During his time at Pembroke College Tolkien wrote The Hobbit and the first two volumes of The Lord of the Rings, whilst living at 20 Northmoor Road in North Oxford . He also published a philological essay in 1932 on the name "Nodens", following Sir Mortimer Wheeler's unearthing of a Roman Asclepeion at Lydney Park, Gloucestershire, in 1928. Tolkien's 1936 lecture, "Beowulf: The Monsters and the Critics," had a lasting influence on Beowulf research. Lewis E. Nicholson said that the article Tolkien wrote about Beowulf is "widely recognized as a turning point in Beowulfian criticism", noting that Tolkien established the primacy of the poetic nature of the work as opposed to its purely linguistic elements. At the time, the consensus of scholarship deprecated Beowulf for dealing with childish battles with monsters rather than realistic tribal warfare; Tolkien argued that the author of Beowulf was addressing human destiny in general, not as limited by particular tribal politics, and therefore the monsters were essential to the poem. Where Beowulf does deal with specific tribal struggles, as at Finnsburg, Tolkien argued firmly against reading in fantastic elements. In the essay, Tolkien also revealed how highly he regarded Beowulf: "Beowulf is among my most valued sources," and this influence may be seen throughout his Middle-earth legendarium. According to Humphrey Carpenter, Tolkien had an ingenious means of beginning his series of lectures on Beowulf: He would come silently into the room, fix the audience with his gaze, and suddenly begin to declaim in a resounding voice the opening lines of the poem in the original Anglo-Saxon, commencing with a great cry of Hwæt! , which some undergraduates took to be 'Quiet!' It was not so much a recitation as a dramatic performance, an impersonation of an Anglo-Saxon bard in a mead hall, and it impressed generations of students because it brought home to them that Beowulf was not just a set text to be read for the purposes of examination, but a powerful piece of dramatic poetry. Decades later, W.H. Auden wrote to his former professor, "I don't think that I have ever told you what an unforgettable experience it was for me as an undergraduate, hearing you recite Beowulf. The voice was the voice of Gandalf." In 2003, Tolkien's handwritten translation of and commentary on Beowulf, running to roughly 2000 pages, was discovered in the archives of the Bodleian Library. In the run-up to World War II, Tolkien was earmarked as a codebreaker. In January 1939, he was asked whether he would be prepared to serve in the cryptographical department of the Foreign Office in the event of national emergency. He replied in the affirmative and, beginning on 27 March, took an instructional course at the London HQ of the Government Code and Cypher School. However, although he was "keen" to become a codebreaker, he was informed in October that his services would not be required at that time. Ultimately he never served as one. In 2009, The Daily Telegraph claimed Tolkien turned down a £500-a-year offer to become a full-time recruit for unknown reasons. In 1945, Tolkien moved to Merton College, Oxford, becoming the Merton Professor of English Language and Literature, in which post he remained until his retirement in 1959. He served as an external examiner for University College, Dublin, for many years. In 1954 Tolkien received an honorary degree from the National University of Ireland . Tolkien completed The Lord of the Rings in 1948, close to a decade after the first sketches. The Tolkiens had four children: John Francis Reuel Tolkien (17 November 1917 – 22 January 2003), Michael Hilary Reuel Tolkien (22 October 1920 – 27 February 1984), Christopher John Reuel Tolkien and Priscilla Mary Anne Reuel Tolkien . Tolkien was very devoted to his children and sent them illustrated letters from Father Christmas when they were young. Each year more characters were added, such as the Polar Bear (Father Christmas's helper), the Snow Man , Ilbereth the elf , and various other, minor characters. The major characters would relate tales of Father Christmas's battles against goblins who rode on bats and the various pranks committed by the Polar Bear. During his life in retirement, from 1959 up to his death in 1973, Tolkien received steadily increasing public attention and literary fame. The sales of his books were so profitable that he regretted that he had not chosen early retirement. At first, he wrote enthusiastic answers to readers' enquiries, but he became increasingly unhappy about the sudden popularity of his books with the 1960s counter-culture movement. In a 1972 letter, he deplored having become a cult-figure, but admitted that "even the nose of a very modest idol cannot remain entirely untickled by the sweet smell of incense!" Fan attention became so intense that Tolkien had to take his phone number out of the public directory, and eventually he and Edith moved to Bournemouth, which was then a seaside resort patronized by the British upper class. Tolkien's status as a best-selling author gave them easy entry into polite society, but Tolkien deeply missed the company of his fellow Inklings. Edith, however, was overjoyed to step into the role of a society hostess, which had been the reason that Tolkien selected Bournemouth in the first place. According to Humphrey Carpenter, Those friends who knew Ronald and Edith Tolkien over the years never doubted that there was deep affection between them. It was visible in the small things, the almost absurd degree in which each worried about the other's health, and the care in which they chose and wrapped each other's birthday presents'; and in the large matters, the way in which Ronald willingly abandoned such a large part of his life in retirement to give Edith the last years in Bournemouth that he felt she deserved, and the degree in which she showed pride in his fame as an author. A principal source of happiness to them was their shared love of their family. This bound them together until the end of their lives, and it was perhaps the strongest force in the marriage. They delighted to discuss and mull over every detail of the lives of their children, and later their grandchildren. Tolkien was appointed by Queen Elizabeth II a Commander of the Order of the British Empire in the New Year's Honours List of 1 January 1972 and received the insignia of the Order at Buckingham Palace on 28 March 1972. In the same year Oxford University conferred upon him an honorary Doctorate of Letters. "My grandmother died two years before my grandfather and he came back to live in Oxford. Merton College gave him rooms just off the High Street. I went there frequently and he'd take me to lunch in the Eastgate Hotel. Those lunches were rather wonderful for a 12-year-old boy spending time with his grandfather, but sometimes he seemed sad. There was one visit when he told me how much he missed my grandmother. It must have been very strange for him being alone after they had been married for more than 50 years." In Tolkien's Middle-earth legendarium, Lúthien was the most beautiful of all the Children of Ilúvatar, and forsook her immortality for her love of the mortal warrior Beren. After Beren was captured by the forces of the dark lord Morgoth, Lúthien rode to his rescue upon the talking wolfhound Huan. Ultimately, when Beren was slain in battle against the demonic wolf Carcharoth, Lúthien, like Orpheus, approached the Valar gods and persuaded them to restore her beloved to life. Whole or part of the information contained in this card come from the Wikipedia article "John Ronald Reuel Tolkien", licensed under CC-BY-SA full list of contributors here.